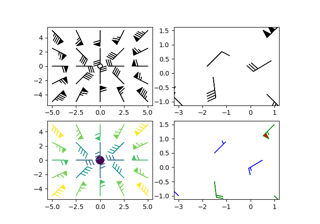 Plot a 2-D field of barbs. All arguments may be 1-D or 2-D arrays or sequences. If X and Y are absent, they will be generated as a uniform grid. If U and V are 2-D arrays but X and Y are 1-D, and if len(X) and len(Y) match the column and row dimensions of U, then X and Y will be expanded with numpy.meshgrid(). U, V, C may be masked arrays, but masked X, Y are not supported at present. Length of the barb in points; the other parts of the barb are scaled against this. Default is 7. The part of the arrow that is at the grid point; the arrow rotates about this point, hence the name pivot. Default is 'tip'. Can also be a number, which shifts the start of the barb that many points from the origin. Specifies the color all parts of the barb except any flags. This parameter is analogous to the edgecolor parameter for polygons, which can be used instead. However this parameter will override facecolor. Specifies the color of any flags on the barb. This parameter is analogous to the facecolor parameter for polygons, which can be used instead. However this parameter will override facecolor. If this is not set (and C has not either) then flagcolor will be set to match barbcolor so that the barb has a uniform color. If C has been set, flagcolor has no effect. A dictionary of increments specifying values to associate with different parts of the barb. Only those values one wishes to override need to be included. The largest increment is given by a triangle (or "flag"). After those come full lines (barbs). The smallest increment is a half line. There is only, of course, ever at most 1 half line. If the magnitude is small and only needs a single half-line and no full lines or triangles, the half-line is offset from the end of the barb so that it can be easily distinguished from barbs with a single full line. The magnitude for the barb shown above would nominally be 65, using the standard increments of 50, 10, and 5.